POLST stands for Physician Orders for Life-Sustaining Treatment. It is a physician order that gives patients more control over their care by specifying the types of medical treatment they want to receive during advanced serious illness. 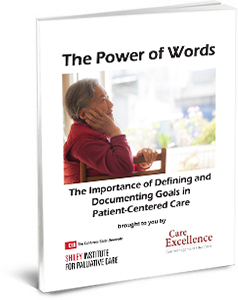 Developed in conjunction with the Coalition for Compassionate Care of California, this course is designed to help the healthcare professional understand the role and value of this document, and how to employ it in documenting and honoring patient wishes. This course provides specific details regarding POLST in California. Register for the brochure on this course by clicking HERE to sign up. Though anyone can have a POLST form, it is designed for those who are seriously ill or very frail – at any age. It is a physician order that documents wishes for treatment at this point in time; provides guidance to emergency medical personnel; usually completed in a medical setting. There is one standard form for California. Who would benefit from having a POLST form? Where does POLST fit in in the Advance Care Planning Continuum? What’s the difference between POLST and Advance Healthcare Directives? What’s the difference between POLST and DNR (Do Not Resuscitate)? What’s the difference between POLST and PIC (Preferred Intensity of Care)? What does the POLST form say about artificially administered nutrition? Who can help complete POLST? When should POLST be reviewed? Can the POLST form be changed? Where should we keep POLST? Who needs to sign the POLST form to make it valid? During this self-paced course you will learn that this extremely important form allows healthcare providers to know and honor the wishes of the patient during serious illness. The Coalition for Compassionate Care of California has developed this course in partnership with The California State University Institute for Palliative Care. Use of the form began in California in 2008, and became part of state law on January 1, 2009. So, What Is POLST? It is not mandatory for anyone to use the form, but honoring the form is mandatory! When traveling in California, “Would any hospital honor my POLST?” The answer is “Yes.” If traveling outside of California, the POLST may be recognized if the particular state is using POLST. In every state, the POLST will be valuable as a statement of preferences describing someone’s wishes for medical care. So Why Do We Need POLST in California? Studies have shown that patient wishes about care are often not known. Even when a patient has an Advance Healthcare Directive, it may not be accessible when needed. Also, Advance Directives are not always clearly defined. There are no age specifications. POLST can be used with both adults and children. Palliative care is patient-centered care, a fundamental step in helping patients articulate who they are and what they need. Sign Up to Download Your Free eBook Here!